Happy 2014!! 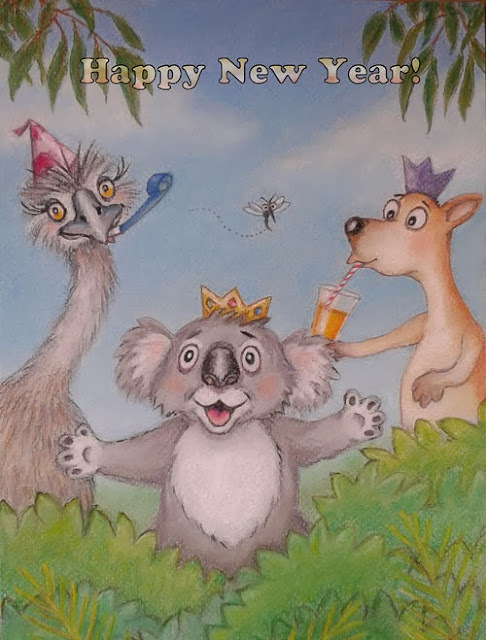 Well here we are again, the start of another New Year! 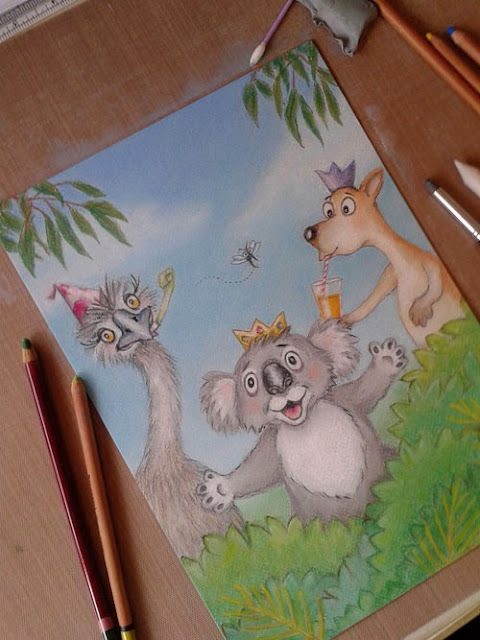 Since I had out the soft pastel pencils from my last art painting "Pondering", I thought I would do this fun New Year's illustration. I dug out my soft pastel blocks and used these alongside the pastel pencils. The last artwork and this one are on 210 x 297mm pastel tinted paper. 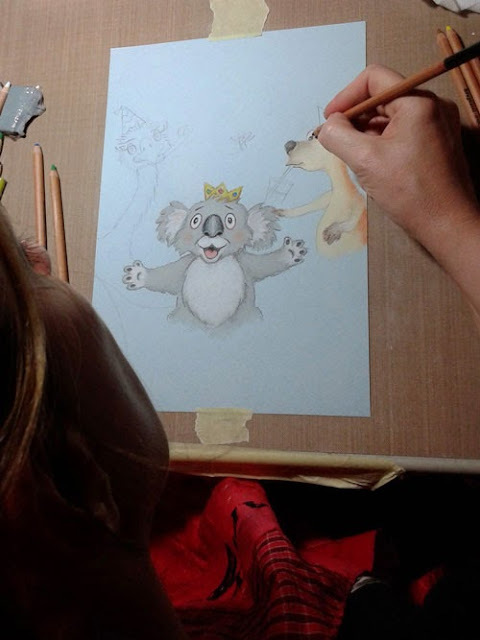 I found that size was a bit fiddly to work with, so if you were interested in trying out pastels, I would suggest a bigger paper size. A little night time work and getting a feel for the characters personalities. 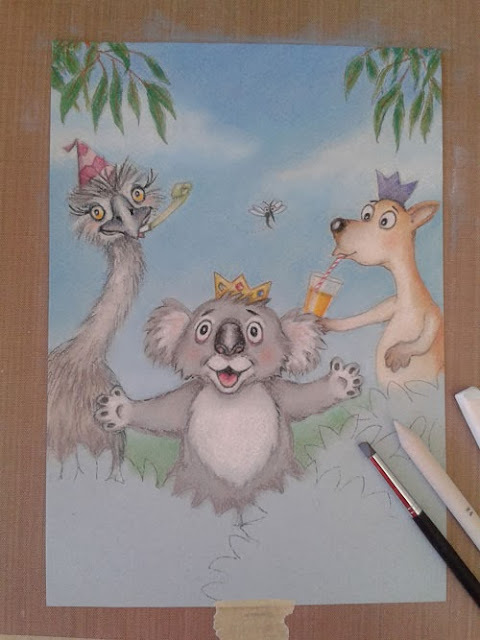 I began with the Australian animals, in hindsight I think I should have started with the background, just to make it easier for blending. Also for tonal value, to see how strong the main characters colours need to be. Just had to share part of my Christmas gift from my very good friend Mish for whom I did an artwork of her two beautiful daughters "On Fairies Wings". 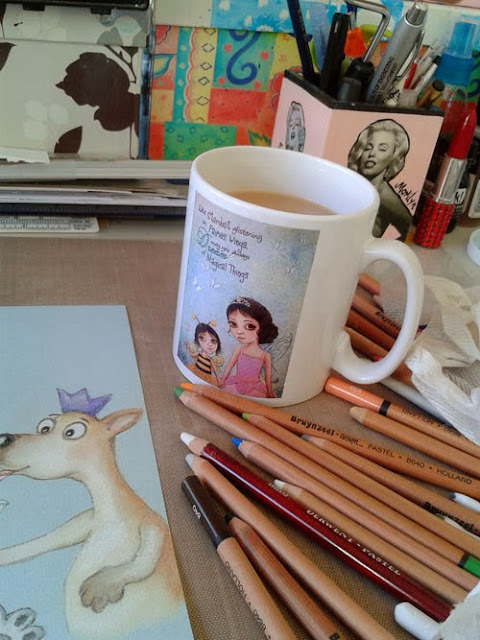 I thought it was a gorgeous gesture, I waved this artwork off to its new home, it came back to me in the form of a mug. As you can see I have already put it to good use! I thought it would be better to work from the top down. I had to remind myself constantly to lift my hand up from the paper when working, as I noticed in the last painting smudging and fingermarks can be a problem. Laying the paper flat is not exactly ideal. I read blowing the pastel dust off is not recommended as it may cause respiratory problems. An easel or desk easel would be a better option, in order for the dust to fall off. To help with the blending of smaller areas, I tried a variety of tools, from the kneadable eraser, a blending stump and a rubber tipped tool to a cotton bud tip. Following this stage, I changed the emu's party blower to a darker blue since there was already a lot of green in the picture. Ok this trio is ready to party! How about you? May 2014 hold many good things for you! Love your Animals - and the blending is amazing! I always just love when you share your artwork. You are incredibly talented. This one made my morning. Happy New Year.